I've always been fascinated by these cars. The Czech-built Skoda 120 was a car of contradictions. On one hand, it was notorious for its lousy initial build quality. On the other hand, it was an extremely successful European rally car (Skodas won their class in the RAC rally for 17 years in a row) and on the street it gained a reputation for being a tough, reliable car. 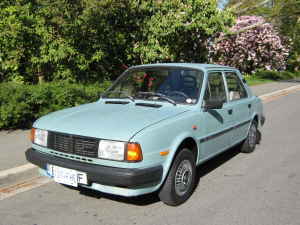 Based on Skoda's earlier S100/110 range of cars, the 120 was introduced in 1976. Its rear mounted, water cooled engine came in displacements of 1.1 or 1.2 liters. (The later Skoda 130, which was based on this car, had a 1.3 liter version on the engine.) Besides the initial build quality problems, the first 120s were criticized for their handling. 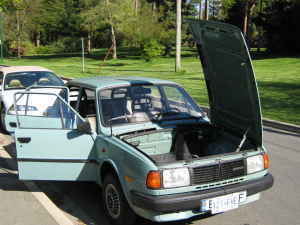 In 1984 Skoda addressed the handling problem by widening the track of the car and changing the rear suspension from a swing axle set up to a a semi-trailing arm layout. With this new rear suspension, UK's Autocar and Motor magazine compared it's handling to a Porsche 911. 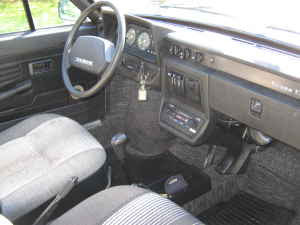 The build quality improved too, but was still not up to the standards of most Western European cars. Skoda had dealers in the US from the mid 1950s through mid 1960s (mostly on the east coast), but the cars never sold well here. 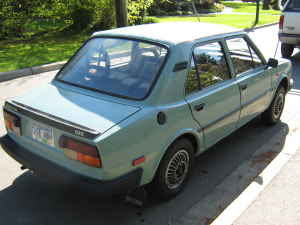 Skoda continued to sell cars in Canada through the late 1980s. They never sold well there either, but today they have a small, but loyal, following. This is located in Vancouver, Canada. It's a 33,000 mile, GLS model with the 1.2 engine and a 5 speed transmission. It appears to be in great condition. I love the side-hinged front trunk. The early-Saab like headrests (including a pair on the rear seat) are a cool, unique touch, too. It will be 25 years old next year and at that point would be easy to register and title in the US. Today's small, inexpensive cars are better built than this car. They're faster and more fuel efficient. They have standard equipment that wasn't even available as an option on this car... But what they don't have is personality. This car has tons of personality. In my world that makes this a very, very cool car. Click here to see the Craigslist listing. Today Skoda is owned by Volkswagen. They've lost much of their uniqueness, but still build some interesting cars. You can find some info about them here.